The art of drumming is finally making its way into the health and wellness revolution. Over the last decade research involving the neuro-biological underpinnings of drumming has seen tremendous growth. Unfortunately, the perception of the art form is still one dimensional. Magazine pages and Instagram feeds perpetuate the portrayal of drumming being only about extreme speed, tricks, and jaw-dropping abilities. Yes, skillful prowess is a significant part of drumming, but it’s not the whole picture. When you take a step back, you’ll be able to notice the remarkable number of positive effects drumming has on your health. Modern technologies like functional MRI screenings give scientists a glimpse at how learning to play a musical instrument engages practically every area of the brain at once. Scientists have concluded that we can not only maintain but improve our brain’s performance and health. The discovery of neuro-plasticity, the brain’s ability to change throughout a person’s lifespan, has put drummers in the driver’s seat of positive change. We now have the opportunity to make the most out of our practice routine by turning it into a brain-enhancing workout. Our brains have the incredible capacity to reorganize themselves by forming new neuronal connections between brain cells (neurons). Research shows that learning something new helps to build new connections and changes the internal structure of the existing connections. When researchers compared musicians’ brains to non-musicians’ brains, they found gray matter (cortex) volume was higher in musicians. This means that every time you practice and push yourself to learn something challenging, you’re building a bigger, healthier brain. Yet that’s not the only brain-changing benefits drumming offers. Deep in the center of the brain lies the hippocampus. This brain structure is critical for learning and memory and is believed to be the place where neurogenesis (growth of new brain cells) takes place. Decades of research indicates we can induce neurogenesis above and beyond what is generally produced by challenging our brain in various ways. For example, the simple act of using your non-dominant hand to do simple exercises (neurobics) during your practice can strengthen the connection between brain cells and produce the growth of new neurons. Do you know what else strengthens neurogenesis? Exercise! 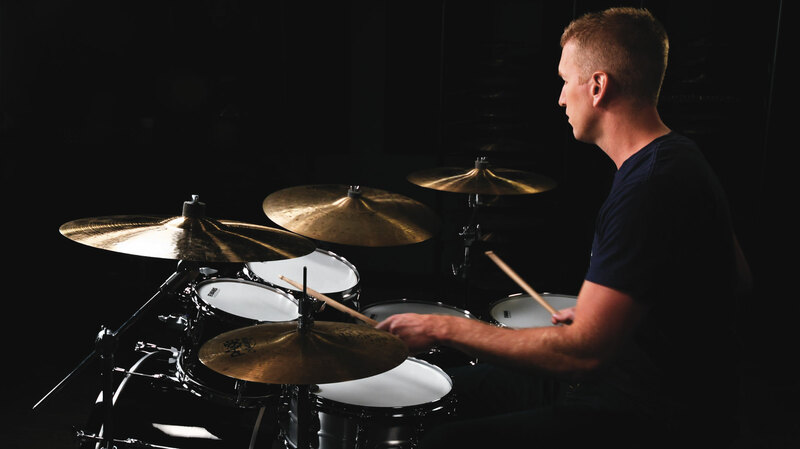 For drummers that means every time you increase your tempo and break a sweat during your practice or performance, you’re actually enhancing your brain functioning. The more physically active your practice or performance is, the better! The bigger your hippocampus gets, the less likely you are to suffer from the effects of aging such as memory loss and the development of dementia. Over the last decade, various research projects have shown how drumming has been successfully used to improve social functioning and treat mental health conditions such as depression, anxiety, addictions, aggression, and PTSD symptoms. However, recent research involving the holistic approach towards the brain-mind-body connection is taking the possibilities of drumming to a whole new level. Meditation and mindfulness training have been a significant part of drumming practices throughout history. Yet contrary to popular belief, drumming as meditation does not have to have religious or mystical associations to be effective. Meditation, or “the act of focusing your mind,” can be part of any drumming experience. The natural part of the learning process of drumming involves meditation in that it deals with mental relaxation. Deeply focusing on the rhythmic patterns controls the thought process and thus helps to reduce mental chatter, induce relaxation, and calm the mind. Even simple drumming practices allow you to free your mind from the “clutter” that trickles down to your overall well-being. Research shows when you meditate on a focal point (such a word, object or rhythmic pattern) your brain can undergo profound physical shifts and rewire due to neuroplasticity. Our experiences, and what we do with our minds, actually change the neurochemistry of our brains and cause the remodeling of brain circuitry. Positive neuroplasticity helps to slow down the brain’s aging process, increase cognitive reserve, improve well-being, and strengthen overall brain power. Equally important, you have the option to incorporate mindfulness meditation “the act of focusing one’s awareness of the present moment” into your practice routine. Science confirms mindfulness meditation helps to alleviate chronic pain, reduce stress, and improve vitality. Incorporating mindfulness into your drumming routine can be as simple as being aware of your thoughts and allowing them to pass by without judgment. But that’s not all – research shows that drumming can also increase alpha and theta brainwave production as well as brainwave synchronization. All of which can lead to heightened creativity, improved problem-solving abilities, enhanced immune system and much more. 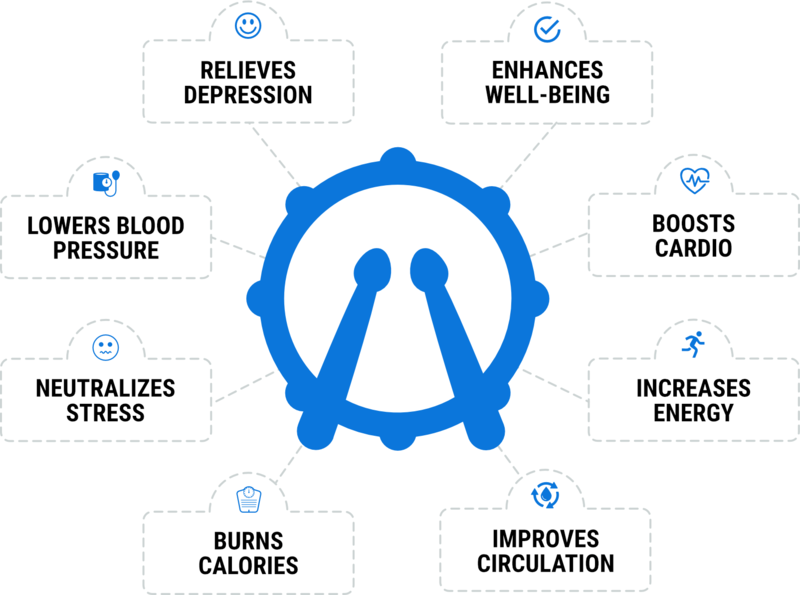 The physical health benefits of drumming seem almost unlimited. The constant movement of the upper body and lower body limbs make for prime fitness activity. Dr. Marcus Smith, from Chichester University, recently concluded that an hour of vigorous drumming could burn between 400 and 600 calories. Research for the Australian International Academic Centre reviewed the metabolic demands of heavy metal drumming and found that it met the American College of Sports Medicine guidelines for the development of health-related fitness. But don’t be fooled by the belief that you need to go extreme to get the full brain-body benefits. Numerous studies have shown that all types of drumming can reduce stress, lower blood pressure, and enhance your immunity. Research involving group drumming added to the list by providing evidence showing it can be used to reduce blood pressure, cortisol and provide relief from chronic pain conditions. As you can see, there are no shortages of health benefits to be had from playing drums. The results are undeniable. These exciting discoveries should empower all of us to be proactive in promoting the art of drumming as the ultimate tool for health and healing. Old stigmas are dissolving, and we, as drummers, have the opportunity to not only create great music but change the world for the better.